Writer and editor Marla Miniano, artist and singer Reese Lansangan, and illustrator Jamie Catt pool their talents for this book. Three of today’s young literary and artistic talents pool their gifts for Summit Books’ new release, In Case You Come Back: Poems, Confessions, Apologies, and Promises. The book is a collection of over 100 poems written by Marla Miniano and Reese Lansangan, with illustrations by Jamie Catt. Marla Miniano is the current editor-in-chief of Summit Books who previously served as editor-in-chief of Candy Magazine. She has penned well-loved novels and anthologies for young women such as Table for Two, Fan Girl, From This Day Forward, and the Every Girl's Guide series, all published by Summit Books. Reese Lansangan is a singer-songwriter whose debut album, Arigato, Internet!, has caught the attention of music aficionados and fellow professional musicians alike, and is a multi-awarded visual artist and fashion designer as well. She also wrote and performed the song “Home” especially for Vic Sotto and Pauleen Luna’s wedding earlier this year. Jamie Catt is a self-taught artist and freelance illustrator whose dreamy pieces have been featured in magazines and websites all over the world. She is regularly commissioned to produce work for both local and international clients, and has gained a loyal following of young artists on- and offline. Together, Marla and Reese deftly tread on blissful subjects such as love and intimacy, and tackle more painful ones such as heartbreak and goodbyes with equal beauty and vulnerability. They also lend their word-weaving to the exploration of topics as varied as science and adventure, family and childhood, and longing and grief, all while maintaining candor and grace with every piece. Jamie’s delicate, whimsical artworks accompany their words all throughout, adding life and color to their quiet musings. 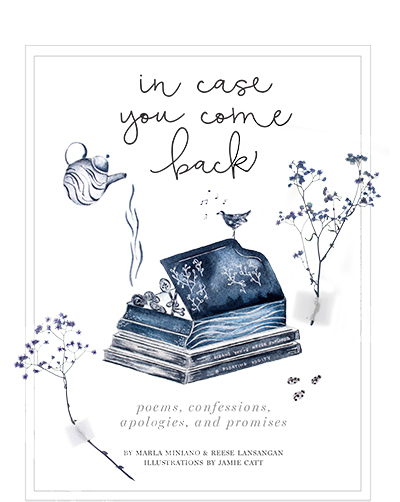 Readers are encouraged to post photos of their copies of In Case You Come Back on Instagram by using the hashtag #InCaseYouComeBack and tagging @summit.books. In Case You Come Back is out now in bookstores and newsstands nationwide for P250. For updates and more information, like Summit Books on Facebook via www.facebook.com/SummitBooks and follow on Instagram via @summit.books.